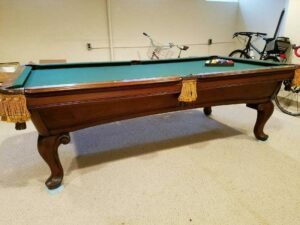 If you’re looking for a classically antique pool table with several ‘unique’ features, look no further: the 10’ Brunswick-Balke-Collender Manhattan pool table is for you! 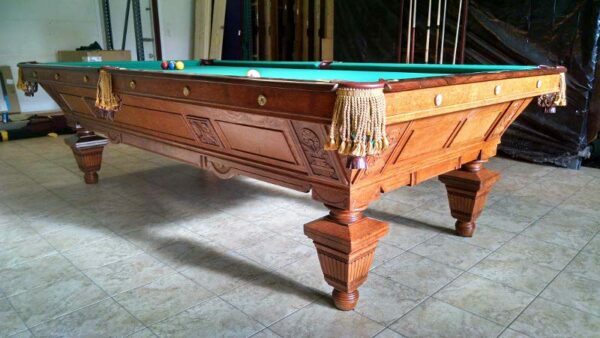 This 1890’s style pocket billiard table is made entirely from solid hardwood oak with Carpathian elm burl. 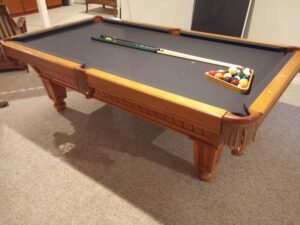 One of the more unique styles of that era, this pool table is handsomely detailed and heavily carved, making it an attractive addition to your game room furniture and decor. 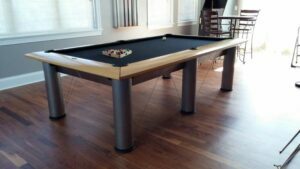 Additionally, the Manhattan has a full KD (knockdown) frame, meaning that the frame comes apart and can be fully disassembled and reassembled – something that you don’t find all too often in pool tables of this era. 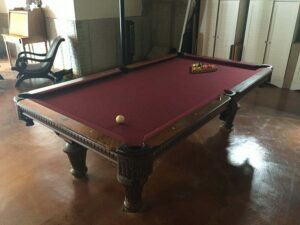 Another defining feature of this table is that it is a 10’ pocket billiard table (aka pool table), which is quite uncommon since most 10’ tables are billiard (no pocket) only. 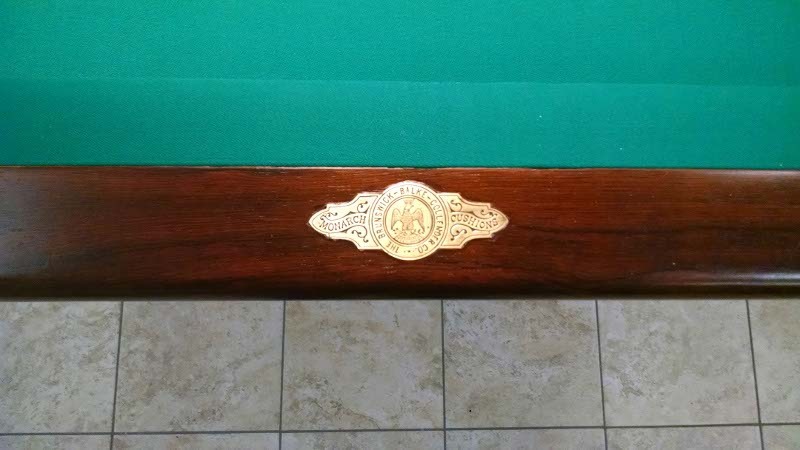 The Brunswick Manhattan pool table doesn’t shy away from details. 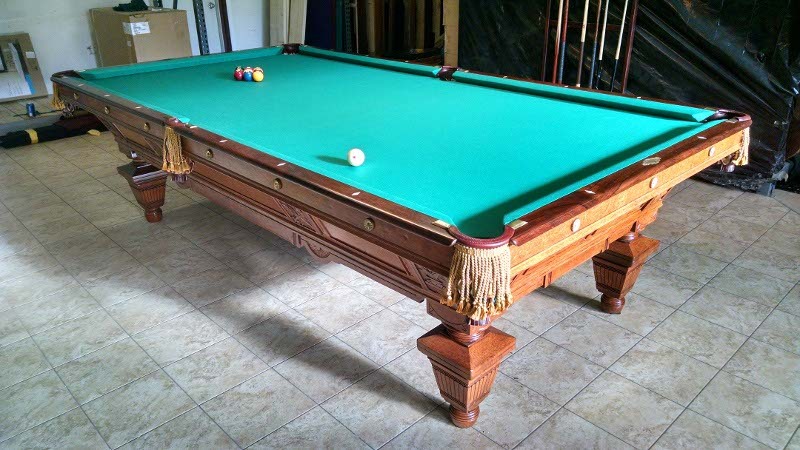 Along with the beautifully carved patterns that envelop the table, the Manhattan boasts solid Brazilian rosewood top rails, 3 piece 1” framed Pennsylvania blue slate, diamond shaped solid ivory sights, and an original Brunswick-Balke-Collender solid brass stamped nameplate. The 10’ Brunswick Manhattan pool table has been fully structurally and cosmetically restored by our team of pool table professionals, and is ready to become a part of your residential or commercial game room! 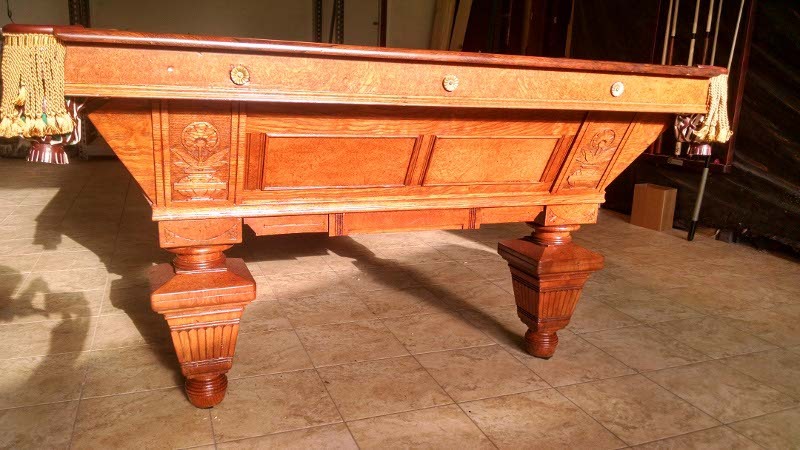 Give us a call today if you’d like more information on this gorgeous antique pool table.